Prior to leaving the City of Brotherly Love, Pope Francis took time to meet at the airports Atlantic Aviation hangar with many of the volunteers and benefactors who made the World Meeting of Families possible. Photo by BradleyDigital. Renewed faith. A candle in the dark. An icon of the church that led lapsed Catholics to return to the fold. These are the gifts representing Pope Francis, which many people said he left in his wake as he bid farewell to Philadelphia after the closing Mass of the World Meeting of Families Sunday, Sept. 27. The sun set as the pope was preparing for his departure for Rome that evening aboard an American Airlines jet. But for Catholics who witnessed his liturgies and heard his words of encouragement, part of his spirit remains. “The pope affected me profoundly. His focus on the family was just what we needed to hear. Family is what I grew up with, but society isn’t like that today. How can there be a church if there is no family? The cardinals picked the right man when they elected him,” said Bill Elentrio, a member of St. Mark Parish in Bristol. Elentrio admitted that he had gotten away from the church for some time, but said the pope’s visit inspired him and strengthened the faith that was the hallmark of his family’s tradition. Bill’s wife Mary followed the pope’s liturgies, talks and visits on television since he landed in Washington D.C. earlier this week. “He’s a walking Jesus. He’s got to be an angel of God,” she said. Shepherd One, the papal plane, took off from Philadelphia International Airport shortly before 8 p.m. The dignitaries waving goodbye included Pennsylvania Governor Tom Wolf, Philadelphia Mayor Michael Nutter; Philadelphia Archbishop Charles Chaput, Auxiliary Bishop John McIntyre and Robert Ciarofulli, president of the World Meeting of Families in Philadelphia. Prior to leaving the City of Brotherly Love, Pope Francis took time to meet at the airport’s Atlantic Aviation hangar with many of the volunteers and benefactors who made the World Meeting of Families possible. He circumnavigated a lounge, clasping hands and smiling, seemingly tireless. He also took time to hold a private conversation with Vice President Joe Biden and his wife, Dr. Jill Biden. 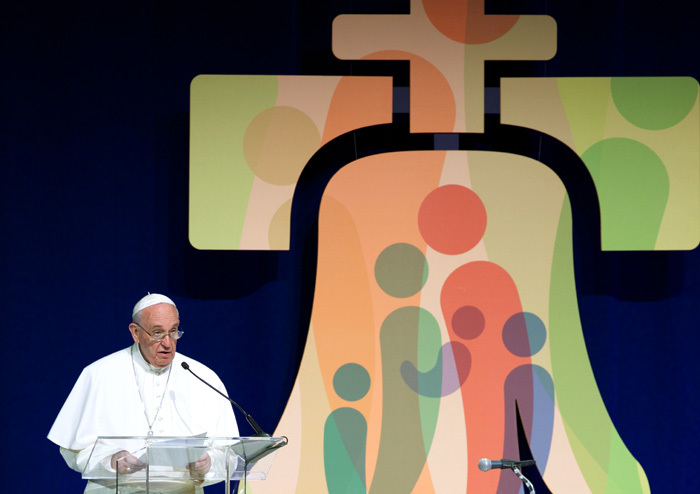 Pope Francis offered a message to the World Meeting organizers gathered at the airport, and by extension, to the 20,000 who attended the congress last week in Philadelphia. “I also thank the families who shared their witness during the Meeting. It is not so easy to speak openly of one’s life journey. But their honesty and humility before the Lord and each of us showed the beauty of family life in all its richness and diversity,” he said. Even as the papal plane took off, pilgrims who attended the pope’s final Mass on the Benjamin Franklin Parkway Sunday afternoon took time to reflect on his impact on their lives. Two sisters, Gidge and Geri Cole, attended several events on the parkway, including Sunday’s Mass. Gidge, a psychologist who treats military veterans at Philadelphia’s Veterans Hospital, said the words of Pope Francis gave her a fresh perspective on the work she does. Her sister Geri is a physician’s assistant, and said she appreciated that the pope highlighted aspects of social justice that need to be addressed, such as poverty, religious persecution, and the death penalty. “He left me with a sense of hope for the Catholic religion, said Geri, who attends Our Lady of the Rosary Parish in Coatesville. JoAnn Lynn, of Bristol, believes that the effect of the pope’s faith and demeanor will help push back on what she sees as increasing antipathy toward the Catholic Church. “If the world can see that Pope Francis is a good guy, maybe the hating will stop,” she said, noting that even those who are not Catholic have expressed favorable opinions of him. The World Meeting of Families was begun by St. John Paul II in 1994 as a means of strengthening the sacred bonds of families around the world. Families are encouraged to share dialogue and prayer, listen to speakers and participate in events designed for parents and children. The Eighth World Meeting, which concluded with the papal Mass in Philadelphia on Sunday, following four days of conferences and other events for adults and youths at the Pennsylvania Convention Center, attracted 20,000 individuals, making it the most successful World Meeting ever held. The next World Meeting of Families will be held in 2018 in Dublin, Ireland.